In developed countries cancer represents the second most common cause of death behind cardiovascular diseases. Until now enormous advances were indeed achieved with newly developed cancer therapies, but in most cases only a prolonged survival could be reached for patients, instead of a cure from their neoplastic disease. 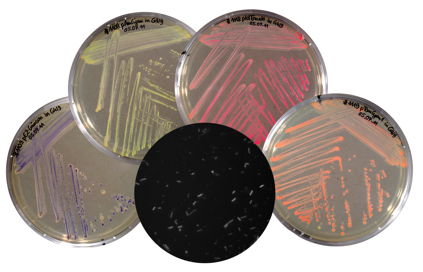 However the development of bacteria for tumor therapy offers a totally new and innovative approach. For a long time it is well-known that most (facultative) anaerobic living bacteria are able to colonize solid tumors, to proliferate and to contribute to tumor destruction. 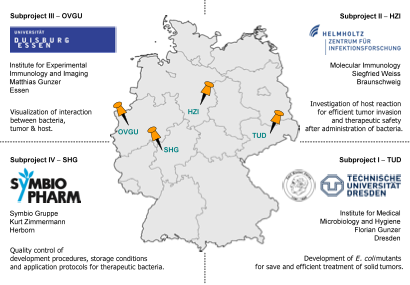 First successful applications of bacteria as tumor therapeutic agents based on modified pathogens like Clostridium perfringens or Salmonella typhimurium. Clinical usage of such biologics unfortunately raises enormous problems with their safety and acceptance, why alternatives with an improved biological safety profile have to be found. Thus the PROTumor network is aimed at investigating the applicability of probiotic intestinal bacteria as a tumor therapeutic agent. For this purpose the joint research project concentrates on the well established Escherichia coli strains Nissle 1917 and G3/10, which both have a proven safety record and are in use as probiotics in humans since decades. 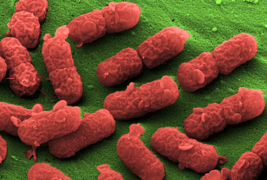 E. coli G3/10, as a component of a probiotic drug, is distributed by the industry partner SymbioPharm. Aim of the PROTumor network is the modification of these strains by genetic engineering to enhance their efficiency of tumor invasion and their selectivity for tumor tissue as well as the improvement of their biological safety. Furthermore, fundamental mechanisms of tumor colonization and destruction through oncolytic bacteria will be investigated by using mouse tumor models and intravital microscopy. Finally, the translation of newly established bacterial tumor therapeutic agents into pharmaceutical production as well as the evaluation of shelf life of a marketable product will be realized by the industrial partner.